National Water Week is an annual celebration of water in Australia which occurs in the third week of October each year. It is designed to encourage the community to take action to help protect and conserve our most precious resource – water. This year National Water Week will run from 21 to 27 October. Buln Buln Primary School year 1/2 student, Edith Box is the winner of our poster competition for 2018. Edith scored herself a prize pack including a $100 iTunes Voucher. Edith also won her school a $500 prize. The funds will be used towards a sustainability project or learning resources. 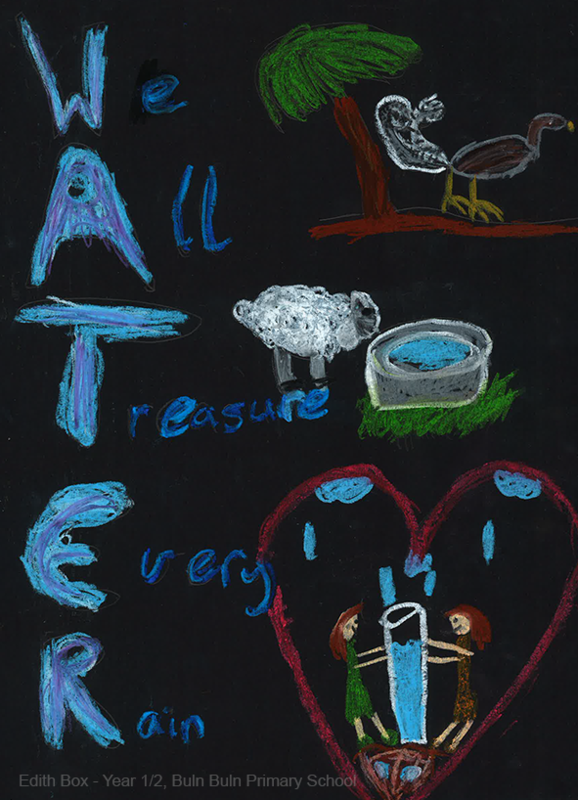 Edith’s entry impressed us for her clever use of a ‘WATER’ acronym, vibrant colour selection and depiction of this year’s theme: Water for me, water for all. Edith’s decision to include a farm animal and two people carefully collecting every last drop of rain was particularly poignant this year, given the drought conditions currently faced by many regional communities. State winners can be viewed on the Victorian Water Industry Association website.